A bill making its way through the PA Senate pits children and working families against seniors and special interests. It would end property taxes for corporations as well as school property taxes, helping struggling homeowners only in the short-term while devastating our schools and making PA’s tax system even more deeply unfair. Because Pennsylvania has long been among the worst states for its low percentage of state funding for public education, districts have had to continually raise property taxes to fund their schools. Under the guise of reducing Pennsylvanians’ taxes, the SB 76 tax scheme would in fact increase the overall burden on people and small businesses due to its increases to the state income tax and sales tax. It also would expand the sales tax to cover a wider range of services and goods – one very important good in particular: food. A broad coalition of business groups, education and anti-hunger advocates, and faith communities oppose this bill. It is mainly large corporations and wealthy landowners who stand to gain from SB 76. 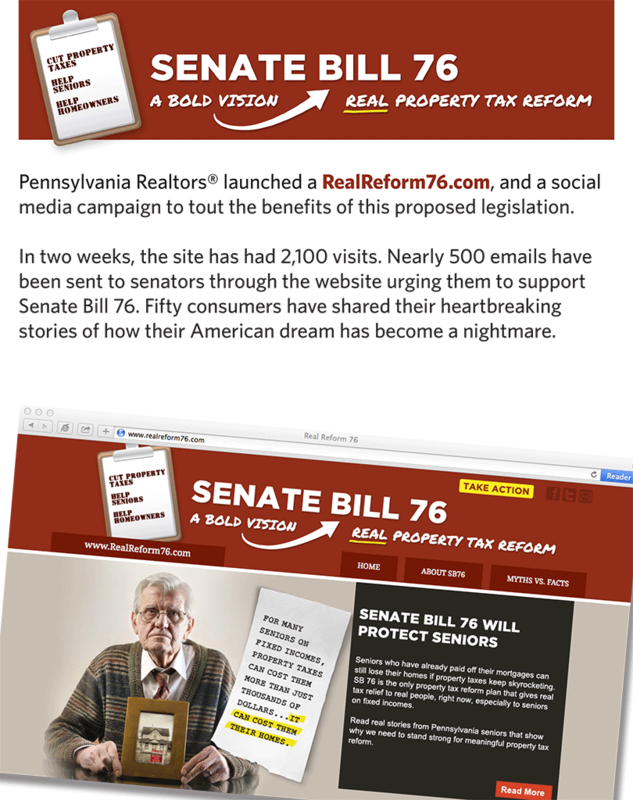 The National and Pennsylvania Associations of Realtors (NAR and PAR) also support SB 76 and created RealReform76.com to push its agenda. Realtors would profit from the huge boon to the real estate market that would come from eliminating the school property tax and large commercial property tax. Also driving the support for SB 76 are Libertarians and Tea Party members – folks reflexively opposed to all forms of taxation, having to support public education, and, by the way, government itself. These groups are at least some of the member organizations of the Pennsylvania Coalition of Taxpayer Associations, a group that has fought school property taxes in PA for years. They claim to represent the anguished cries for SB 76 that come from financially struggling homeowners – particularly the elderly, a demographic that has high voter turn-out and whom PAR has mobilized into vocal and strident supporters with promises (glossy brochure and web content pictured) about how SB 76 will help them. What would SB 76 do? What PAR and PCTA (and their online presence as Pennsylvania Taxpayers Cyber Coalition) fail to note is that SB 76 and its companion House Bill 76 come with their own huge price tag that would affect all Pennsylvanians: devastating cuts to our schools (which rely heavily on local property taxes) and thus our communities. Not to mention what it will do our grocery bills. Yes, SB 76 has sales tax exemptions for the limited food items that pregnant and nursing women can buy using their Women, Infants, and Children program (WIC) benefits. Only certain categories of food and certain brands, ingredients, and packaging sizes are WIC-eligible. Most packaged foods and specialty foods will be subject to sales tax under SB 76, as will organic food. SB 76 would also add a sales tax to child care services, non-prescription medications, funeral expenses, non-tuition fees at some colleges, non-housing charges at many nursing care facilities, garbage collection, parking fees, taxis, and public transit. The personal income tax would be raised by 41% – from 3.07% to 4.34%. Pennsylvania already has the 6th most regressive tax system in the nation. Raising and expanding the sales tax and the hiking the personal income tax just shifts even more of the burden of funding government and public services onto those least able to bear it. What would SB 76 do to education? From the Pennsylvania Budget and Policy Center. Click to enlarge. Pennsylvania is second worst state in the nation for its funding gap between rich and poor schools. The funding gap is over $14,000 per student between the richest and poorest PA district; the difference equates to more than $357,000 per year in a classroom of 25 students. This is a problem nationwide. Because schools generally rely on property taxes for their funding, higher-valued houses and real estate generate more revenue and better-funded schools than districts with lower home values. 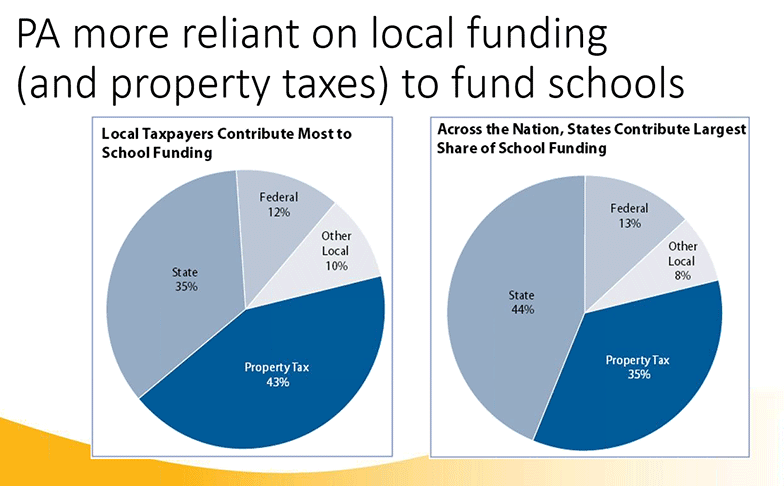 Because Pennsylvania is one of only three states in the nation that doesn’t use state funding to balance out gaps between rich and poor school districts, districts depend on a disproportionately high ratio of local to state funds, getting 80% of their local funding from property tax revenue. The outcomes are not surprising: state cuts to education funding are more likely to hurt low-income and minority students stuck in poor districts. These cuts have long-term effects on student achievement in high poverty districts. The sales tax is a regressive tax; raising it hurts those who are low-income and middle class more. An income tax still means that neighborhoods with wealthier residents will have wealthier schools and will not address the funding disparities that now exist between PA school districts. Both income and sales tax revenue dip during recessions. SB 76 would also leave it up to voters whether school districts can levy any other taxes to raise money to repair or improve school buildings, likely forcing them to make even further cuts. It would also cap education spending at a rate lower than what school districts need to keep up with rising costs. Don’t we need property tax reform? Yes, there are fixed-income and low-income homeowners in PA who are struggling to pay for housing and they need help. But the answer is not ending all property taxes statewide. 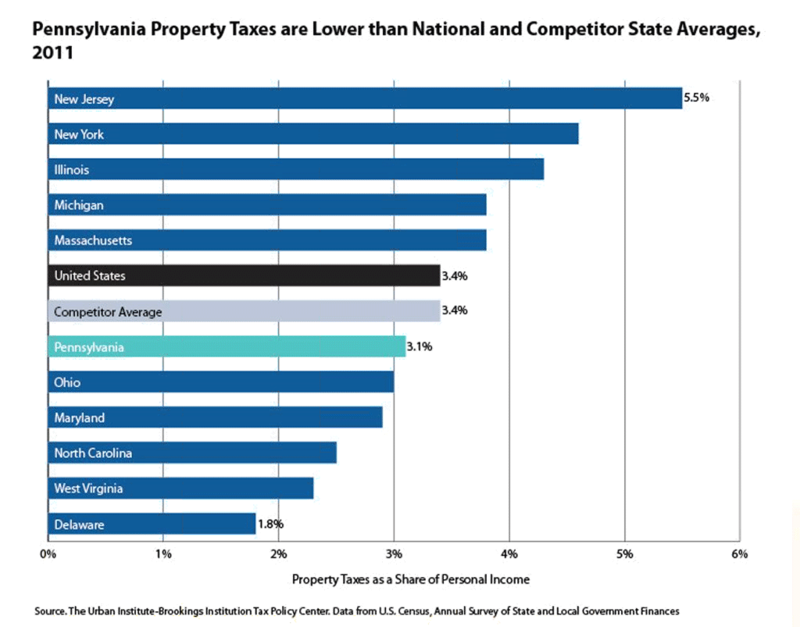 While there are segments of Pennsylvania with high property taxes, they are the exception. On average, Pennsylvania’s property tax rates are on par with Ohio and significantly less than neighboring states like New York and New Jersey. This isn’t to say those who need tax relief shouldn’t get it. But there are better and more targeted ways to achieve that, like reinforcing existing assistance programs or creating new ones, and supporting reassessments and other reform measures. For example, only some 70% of the seniors who are likely eligible actually apply for PA’s Property Tax Rent Rebate Program, which helps half a million of Pennsylvania’s elderly, according to the Pennsylvania Budget and Policy Center. This program could be better-funded (the base benefit hasn’t increased in 8 years) and the application simplified. PA could adopt the “circuit breaker” programs some states use to reimburse low-income property owners if their property tax is a certain percentage of their household income. Measures that don’t, by the way, eliminate all property taxes for corporations that own shopping malls, factories, skyscrapers, and other large commercial enterprises. Nearly one in four assessed properties in PA are commercial or industrial; much of that is corporate-owned. Eliminating all property taxes in PA would be a gross overstep. It’s throwing the baby out with the bath water. Almost literally – as it is our children who SB 76 will hurt most, by sinking their schools and taxing the food in their mouths. SB 76 is currently being pushed by both Democrats and Republicans in the state legislature because the bill’s supporters are organized and persistent. Our senators have told us they need to hear more opposition. We must speak out against SB 76. Call your state senator. Tell them: A bill that lets corporations avoid paying their share, that taxes food as well as child care and other necessary services, and that raises the income tax will not help our public schools and will make low- and middle-income Pennsylvanians pay even more. There are better solutions to reducing the property tax burden for struggling homeowners. Oppose SB 76! Tweet to @PASenate and your senator! This post has been updated since it’s original publication date to include new information. Have you actually looked at the property tax rebate program. I am a CPA. I have a client who sold her home which she could no longer afford. She moved to a more modest townhouse. She lives on about $13,000 a year, pays $3,000 in property tax. Her rebate” was $600. We need property tax elimination not “better funding”. Better funding will never happen. Yes, Pa.’s tax system is deeply unfair. But so is eliminating property taxes, which, given how little our state government puts toward education, will hurt our public schools and the millions of families who depend on them. We clearly need a Marcellus shale tax and the elimination of corporate tax loopholes in order to pay for property tax rebates for low-income households. Robbing Peter to pay Paul is not the answer. This article is nonsense. The special interests in the name of greedy teachers and greedy unions is what keeps the status quo of unfairness here. Why should property owners foot the majority of school expenses in Pennsylvania? Let everyone pay with higher sales taxes etc, then everyone contributes to education.Wake up, idiots. “Nonsense”? “Greedy teachers”?! “Idiots”? We probably shouldn’t dignify your rude remarks with a response, but we feel we should correct your misstatement. In fact, everyone pays property taxes, whether they own property or not. Landlords pass property taxes on to renters via rent. And property owners can always sell their property. Renters, on the other hand, have little to show for their years of paying property taxes, except a roof over their heads. Raising the sales tax hits those who are struggling hardest and could reduce purchases and, ultimately, jobs. But we agree with you that another solution than continually raising property taxes to fund our schools is needed. The real issue is: why is such a large portion of the bill falling on Pennsylvanians’ shoulders via property taxes? Why does our state government put less towards education than nearly all other states? How significant is one cent state sales tax increase on purchases made by anyone in this state and country today? It’s amounts to practically nothing in our society today, no matter what income level one comes from. The lack of being gouged any further by giving a blank check to local school boards perpetually raising school taxes on property owners is a greater good than what we’re currently experiencing today.Special interests want to keep the status quo, because they would lose their spending authority, and have to follow a budget as everyone else does .What’s wrong with that? Then maybe , as in the case of our local district, the school board wouldn’t have approved $1 million to replace AstroTurf at our local stadium. You and I both know that it’s human nature to not reign in spending if there really aren’t any checks and balances that keep things under control. Critics of SB 76 always claim that education would suffer as a result of this bill. So why does the vast majority of school property taxes go to fund teachers pensions and salaries? That’s where the true problem lies. A one cent sales tax increase is indeed insignificant. But nobody is proposing that. What they have proposed is an increase of more than 1 percent, from 6 to 7.25% (which is a relative increase of 20%). That would make PA’s sales tax the second highest state sales tax in the country. In Pittsburgh/Allegheny County, the sales tax is already 7%. In Philadelphia it’s already 8%. As for your complaints about the costs of education being driven by teachers pensions and salaries: In 1979, 38% of people in the private sector had a pension thanks to the power of labor unions. That number is now 13%. (It is likely higher in the public sector where labor unions have not been so systematically destroyed.) Thanks to the war on labor unions and rising costs of living, there’s been a steady decline in employer benefits and stagnant wages. As a result, most Americans have little to nothing in savings. We should all be thankful teachers still have pensions and middle class salaries. They’re what attract good people to the field and make good teaching possible. And why should we begrudge teachers good salaries and pensions? They are dedicating their lives to educating our children and thereby strengthening the future of this nation. Isn’t that a value you share? If not, you’re in the minority. Despite the bad review America’s public schools get from critics of teachers unions and those seeking to privatize the system, polls show that a large and growing majority of Americans like their child(ren)’s public school. As for your school board — yes, any government body should have checks and balances on its authority and any taxing authority should have a budget, though spending beyond the budget can often be a sound decision for purposes of economic development and investment opportunities. $1 million for astro turf certainly sounds like a silly use of funds, and possibly a bad deal. But if they’re democratically elected you can speak your mind, hold them accountable, and vote against them on election day. But again, if PA had a fair tax system — instead of one of the nation’s most unfair tax systems — in which corporations and the wealthy paid their fair share we wouldn’t have to be funding our schools through property taxes. Property owners could always sell their property? Really? And live where? It’s so easy, isn’t it? This propaganda coming from your last comments are truly unbelievable. And, for the record, it was a Republican State Senator, David Argall, who sponsored PA SB76.Its not about politics, it’s about fairness. And yes, it shouldn’t be about politics but about fairness. Just Harvest is a nonpartisan organization. Our elected officials should be working to make things better for ALL of us, not just those with money. But when they don’t, we’re going to point it out, regardless of their party.